Sometimes the most overwhelming decision is not deciding which path is better, but just which one you will choose if they are both (or all!) looking pretty much equal :good, bad, or maybe just unknown. When I am torn between choices, sometimes staying where I am seems like the best option, the path of least resistance. But then I realize it's not the necessarily the indecision that is immobilizing me, its the fear and insecurities that rise up when I take a step forward in a certain direction. Suddenly I become unsure, and the other paths look more appealing. Until I take a step towards them. I find myself stuck at the fork in the road. Fear is never a good reason to stay where you are! Fear will keep you in a rut at the fork. You can't learn, and you can't grow when you are in a rut. You are not moving forward in a rut. Ultimately, you will not be happy in a rut. Ruts are where regrets grow. I feel like I find myself in a rut fairly frequently. Maybe I have Life ADD, and I just get bored with the paths I take too quickly. Maybe I'm a chronic short-path chooser. I meander off on rabbit trails (for the record, there's lots to be learned on rabbit trails) and then find myself looking for a new path when that one inevitably tapers off. I've never really committed to a freeway. I've seen my friends get on freeways, whether education, careers, marriage, or other long-term commitments. The idea is equally appealing and off-putting. After all, there is a certain security in short-term rabbit trails. They either end, or you can follow a different one fairly easily, so if you don't like it there are no worries. On the other hand, you're getting nowhere fast! I hit a milestone (in my eyes) birthday this year, and I got to open a letter I had written myself 10 years previous. I had all sorts of expectations and a mild sort of dread of this letter. I didn't remember exactly what I had written in it, but I had some sort of idea and I thought I would read it and feel I had failed my 10-years-younger-self. As it turns out, I read it and realized I really was not that person anymore, and I didn't care that I hadn't met her expectations (some of which were really bizarre) since they were no longer important to me. And I was extremely thankful that the last 10 years had shaped me into who I am today, and had not kept me as the person I was then!! However, the letter has set off a period of reflection for me. Shortly after my birthday I left my job (for completely unrelated reasons! ), which now seems strangely like the end of a rabbit trail, and I've had a lot of free time to think and ponder about the next 10 years. What do I want to do between now and then? Who do I want to be? What is important to me? What am I holding onto that is not? Why am I holding onto it? I've felt on the verge of something. I feel like I need a change. A big one. Or at least big for me! I'm tired of my old fears holding me back. 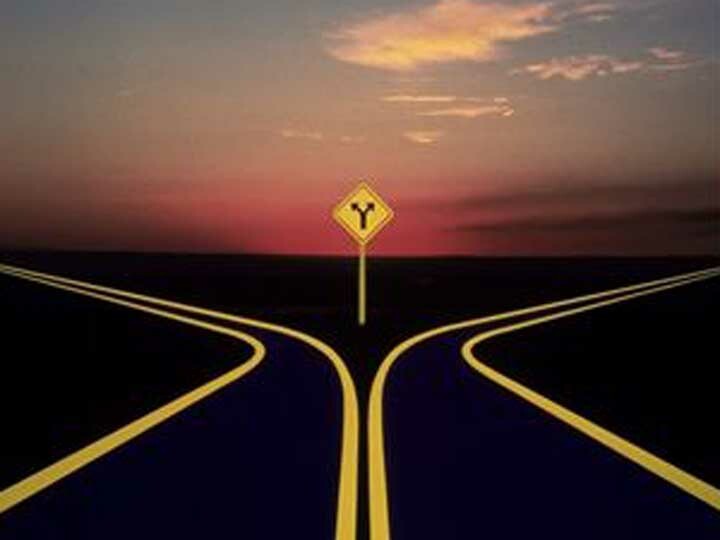 I'm evaluating the fork in the road, and I am deciding which direction to take. I'm not sure yet, but I think 2013 will have a lot of changes in it. Well, those last 10 years sure flew by! You've experienced lots in the last 10.. wonder where your rabbit trails will take you now? Maybe they're all just very different stretches of scenery along the one long highway of life.